Nicaragua, the largest country in Central America, is world famous for its lakes and volcanoes, including Lake Nicaragua, the largest in the country, and Cosiguina Volcano, a spectacular tourist attraction. Its tropical climate favors a host of tropical trees and flowers. The country’s national flower graces several denominations of Nicaragua’s Cordoba currency. The local name of Nicaragua’s national flower is sacuanjoche, which comes from the Nahuatl language of the Aztecs. 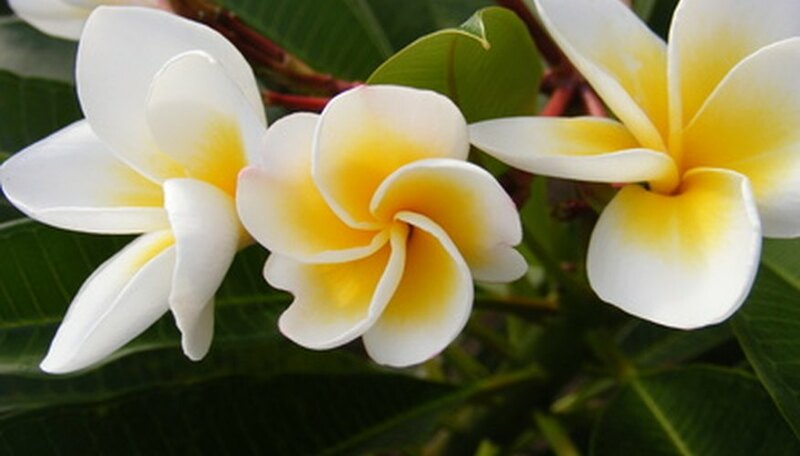 The highly fragrant, spiral-shaped flower grows on the Plumeria alba or white frangipani tree. The leaves of this tree are about 20 inches long and cluster at the tips of the upright and tightly packed branches. Sacuanjoche blooms around May, exhibiting showy white or cream colored blooms. The tree attains a height of around 20 to 25 feet with a similar spread. It prefers full sun, but will tolerate partial shade, and thrives in well-drained clay soil. Given ideal conditions, this tree can grow an average of between 12 inches to 24 inches a year. The branches tend to bruise easily, at which time they exude a milky sap. Cochliostema (Cochliostema odoratissimum) has highly fragrant violet-blue flowers that form in stalked clusters, and purplish-green leathery leaves. This striking plant develops as an epiphyte (growing within the branches of trees and other natural crevices). It is a member of the Commelinaceae family, and is native to Nicaragua and other countries in Central and South America. The night blooming cactus or cereus (Hylocereus undatus) is commonly called red pitaya, dragon fruit and strawberry pear. It finds homes in rocky crevices or tree branches as a climbing plant and an epiphyte. This species features large white to yellow flowers with long and narrow petals. Its fragrance permeates the air when it opens in the early evening to remain open overnight. A further delight of the night blooming cactus is its fruit, which people eat fresh, or use to make wine, smoothies or pastries. The night blooming cactus is a source of calcium, fiber and Vitamin C, according to the National Tropical Botanical Garden. The showy, red-flowered African tulip tree (Spathodea campanulata) is one of Nicaragua’s beautiful imported tropical plants. It may also be called Santo Domingo Mahogany, even though it is a member of the Bignonia family, and not at all related to mahogany. Its Spanish name is flor de fuente, which means fountain flower, alluding to the cup-like shape of the flowers that provide a small drinking fountain for birds and insects. The African tulip tree is fast-growing. What Flowers Grow Well in Arizona?